Theresa Morrison is a wonderful fiddler with a unique style. An octogenarian, she is still adding to her repertoire -composing and interpreting soulful music. She remains an inspiration to the entire musical community. 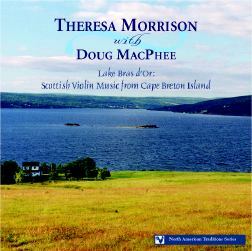 On Lake Bras d'Or, Theresa's 2nd CD release, she is joined by the pianist, Doug MacPhee, for an exceptionally varied program of fine Scottish and Cape Breton melodies. A true original, both of Theresa's recordings contain predominantly previously unrecorded tunes. More about Theresa.